LED brake light bulbs have many advantages over those old Honda CRX filament bulbs like longer life, lower power consumption, and more vivid color. LED brake light bulbs are a great choice for your Honda CRXs tail light needs. Our LED brake light bulbs for Honda CRX provide the best light output for safety and reliability Hidsrus.com. With our plug and go technology LED tail light bulbs for Honda CRX take only a few simple steps to finish the install. LED brake light bulbs will last longer and burn brighter than your stock Honda CRX bulbs. LED brake light bulbs are a great upgrade. Check out all Our LED tail light bulb kits and many other led products to give your Honda CRX a whole new look. We stand behind our LED brake light bulbs with great customer service and offer a lifetime warranty upgrade for your bulbs. 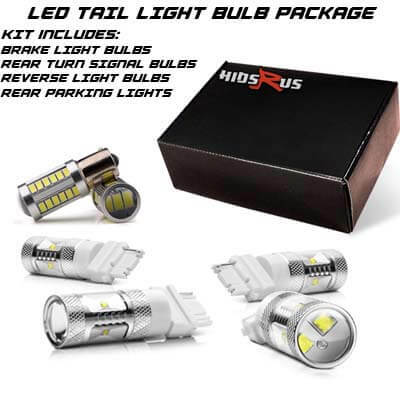 Check out Our hidsrus.com reviews, you'll have peace of mind knowing you ordered high quality LED brake light bulbs that will last your Honda CRX for years to come. Original Stock Tail lights Aftermarket Tail lights I do not know. LED tail light bulb installation is quick and easy. Simply remove the old lights then install the new LED taillight bulbs and see the difference. Never get pulled over for a tail or brake light bulb out again. Halogen bulbs produce a tremendous amount of heat that over time reduce the life of the tail light plastics. It is widely known that some aftermarket tail light housings fill with condensation quickly after installation. Not to mention the majority of the aftermarket Altezza, Euro, Smoked and Clear style tail light products available look tacky and have way to much going on. Upgrade what counts and save. Keep your original OEM tail lights and upgrade the bulbs themselves. OEM grade plastics used are made to last a very long time. Our products are water resistant, shock resistant, vibration resistan, and dissipate heat very well. Keep your vehicle D.O.T. (U.S. Department of Transportation) compliant. Bring your vehicle up to today's standard for lighting technology. Since 2004, HIDSRUS has been a premier LED Taillight Bulb product distributor online with thousands of satisfied customers. Upgrading your factory halogen tail light and brake light bulbs has never been easier. We have been through many different style bulbs as the technology progresses. After doing our own R and D we can proudly state we currently offer some of the best components in the industry. All of our products are shipped from the USA with same day shipping if orders are placed before 1 PM PST. Unlike other vendors, we have a call center based in the United States and can answer any questions you may have about our products or if you need installation assistance. Customer service is our number one priority. Upgrade your original tail lights today to enhance your light output and safety over the standard factory halogen bulb. Two year warranty included with every product. We stand behind every product we sell. Every product comes with our standard HIDSRUS 2-year warranty, free of charge. They will work, we guarantee it. LED technology has been around long enough now that we as a supplier have seen it progress. We have seen it all and can get your vehicle upgraded with little effort and no headaches. Simply remove your original halogen bulbs and install our upgraded LED bulbs the exact same way you removed the original halogens.